RIT is advancing interactive medical technologies to help people dealing with addiction, anger management and violent behavior directed at their family and intimate partners. These digital tools can teach coping skills and keep clients focused on recovery. 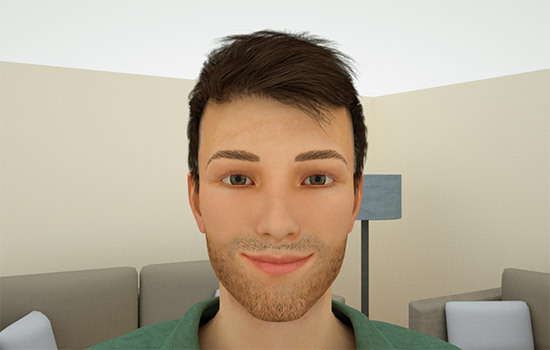 Avatars like RITa and RITchie are a new kind of digital therapy that gives RIT’s College of Health Sciences and Technology an edge in mental and behavioral health research. The virtual duo will be on exhibit at the Avatar/SimMan booth at Imagine RIT: Innovation and Creativity Festival on May 6, in RIT’s Gordon Field House and Activities Center in the Recreation Zone. Easton, a licensed clinical psychologist and a professor of forensic psychology in the College of Health Sciences and Technology, leads the multidisciplinary Behavioral Health Medical Interactive Therapy team with Richard Doolittle, vice dean of the College of Health Sciences and Technology. In addition to RITa and RITchie, the public can also explore SimMan, a commercial product made by Laerdal Educational Services. SimMan represents another kind of digital tool that is used to educate students and train medical personnel. SimMan is an interactive technology that simulates breathing and blinking, a beating heart and talking in response to medical and behavioral situations. Along with Easton and Doolittle, exhibitors include students Meghan Lewis, Keli DiRisio, Brittany St. Jean, Cassandra Berbary, Joshua Aldred, Jason Chung, Akshay Kumar Arun, Anthony Perez and Karie Carita, as well as community partners Alli O’Malley and Nicole Trabold.